Sault Ste. 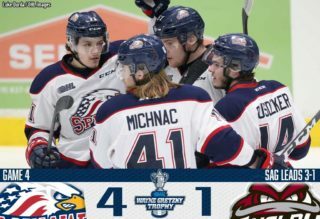 Marie, ON – The Saginaw Spirit drop their first game of the post-season in a 3-0 Soo Greyhounds victory Thursday evening. 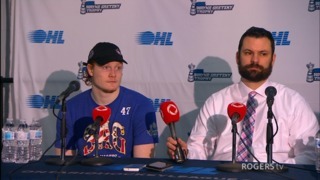 The Greyhounds forced a Game Five in the Western Conference Semifinals with the win. Matthew Villalta stopped all 25 Saginaw shots to complete the shutout. It is the first time the Saginaw Spirit has been shut out the entire season. Spirit goaltender Ivan Prosvetov collected third star honors with 26 saves in a losing effort. The Spirit will look to close the round two series at The Dow Event Center Friday, April 12 at 7:05 p.m. The goaltenders were the story in the first period, Arizona Coyotes draft pick Ivan Prosvetov and Los Angeles Kings signee Villalta matched each other save-for-save. Detroit Red Wings prospect Brady Gilmour nearly gave the Spirit the lead early after a Greyhounds giveaway in the slot. Gilmour attempted to stuff the puck into the left side of the net but Villalta kept the puck out of the net. Big saves early by Prosvetov on Morgan Frost and Jaromir Pytlik early in the first period. Frost, the 2017 first round of pick of the Philadelphia Flyers, came around the back of the net and took a wrist shot from the right face-off dot that was stopped by Prosvetov’s pads. Pytlik, who leads all OHL rookies in post-season scoring this season, attempted to jam rebound into the Spirit net but Prosvetov held strong and covered the puck. Great save by Prosvetov on Kartye while Saginaw had a man-power advantage. Kartye skated into the Spirit zone on a two-on-one shorthanded rush and took a wrist shot from the right circle that was denied by the Russian goaltender’s pad. 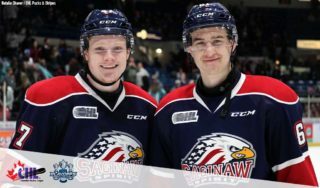 Saginaw nearly took the lead on a man-power advantage by New York Islanders second rounder Bode Wilde. 2017 Florida Panthers first round pick Owen Tippett slid a pass over for the Spirit defenseman Wilde to one-time but Villalta made a nice save to keep the game even. There was no scoring in the first 20 minutes of play and Saginaw outshot the Soo, 11-8 in the first period. The Spirit opened the second period shorthanded and Prosvetov made several big saves on Brighton, Michigan native Keeghan Howdeshell. Howdeshell took a wrist shot from the top of the slot that was fought off by the Spirit goaltender’s blocker. The Soo Greyhounds opened the scoring 6:17 into the second period with overager Jordan Sambrook’s first goal of the post-season. The Soo had a three-on-two rush in the Spirit zone and Jaden Peca sent a pass over for Sambrook to one-time into the Saginaw net. The Soo outshot the Spirit, 14-6 in the second period of play and took a 1-0 into the second intermission. Sault Ste. Marie, Ontario native Camaryn Baber had a chance to tie the game for Saginaw just under five minutes in the third period. The Saginaw center skated into the Soo end on a rush and took a shot from the right face-off dot that was caught by Villalta’s trapper. With just under four minutes remaining in regulation, Howdeshell gave the Greyhounds a two-goal lead on the man-power advantage. Frost centered the puck to the slot and the overager redirected the puck past Prosvetov for the goal. The goal was the first allowed by the Spirit on the man-power disadvantage of the post-season. 2018 Arizona Coyotes fifth overall pick Barrett Hayton added an empty-net to give the Soo Greyhounds the 3-0 Game Four victory. 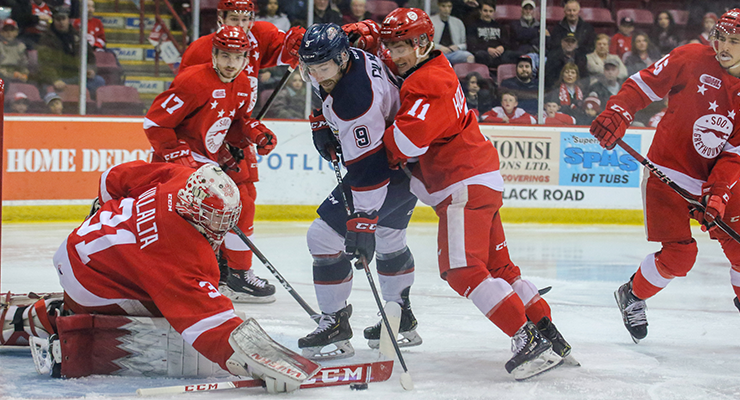 Saginaw will look to close out the Western Conference Semifinals Friday, April 12 when they host the Soo Greyhounds for Game Five. 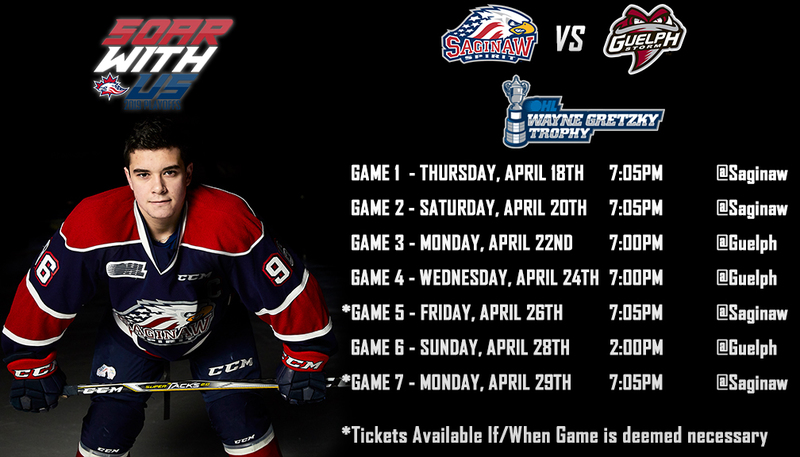 Puck drop from The Dow Event Center is set for 7:05 p.m.
Tickets for Game Five are on sale now on saginawspirit.com, ticketmaster.com, and at the Saginaw Spirit Store at 5789 State Street in Saginaw. Watch live on OHLLive.com or listen live on the flagship WSGW Newsradio 100.5 FM Talk and Sports and fmtalk1005.com with the voice of the Saginaw Spirit Joey Battaino and Dennis Desrosiers on the call. “Countdown to Faceoff” with host Domenic Papa starts 15 minutes prior to puck drop.